Step 1. Begin with a sock or 2, a bowl of lentils and rubber bands. This is a great way for kids to utilize random old socks that have lost their counterpart or no longer fit. Step 2. 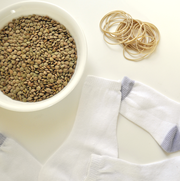 Fill sock to just above the heel with lentils and tie with a rubber band. Create a head by tying a ribbon just below heel - around the "neck". Cut cuff down the middle to make ears. Step 3. Using felt, either cut out nose or draw nose and eyes with markers. Mini pom poms can be glued on for hands, feet and a tail. Step 4. 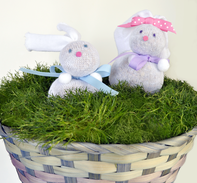 The sock bunnies are ready to display - shown here on a bed of irish moss in a basket. It's much better than plastic grass and can add beauty to the garden or a flower pot -long after Easter is over! 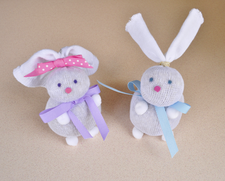 * This upcycled Easter craft was inspired by the Disney Family Magazine. More examples can be seen HERE.